Just so you know, it looks even worse on me. In the spirit of full disclosure, I wanted to show you that not all my garments are nice. Some are positively hideous. 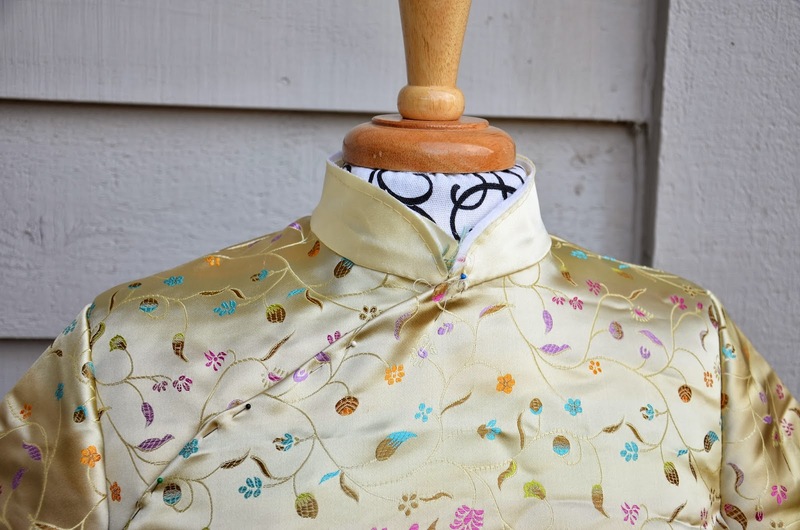 Of course you are distracted by the nice brocade fabric and the exotic qipao design. Don't. Pay attention to the darts, people. And the armscyes, which are beyond sad. I am going to brutally analyze this for you, so we can all learn how not to fit garments. The neck and collar are nice. The collar, incidentally, is a muslin. So the fabric is not the actual fabric. I was experimenting with the shape (because, remember, I draft by feel, not formula) and the kind of interfacing, and where to apply it. Verdict: the collar passes. The shoulders also pass. Marginally. There is something wrong with the shoulder point. 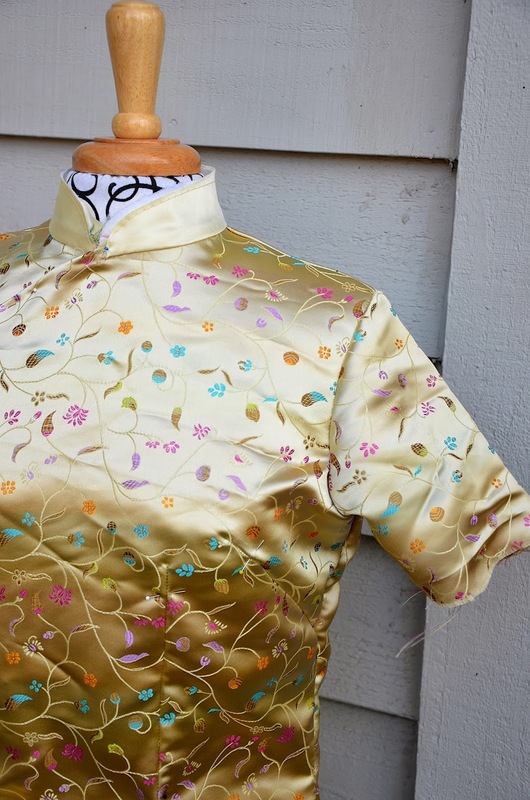 Or, rather, the shoulder point is correct but for this qipao blouse, it needs to be cut in a little bit. And the armscyes... mrpppphhht... well, let's change the subject. Incidentally, I don't do cap sleeves, even though those are the traditional sleeves for qipaos. My arms are not traditional, skinny Asian arms. I swim and eat chocolate, so let's just say that set-in short sleeves are better. Do you see the pins near the dart points? I put them there because I thought that putting the points farther away from the bust apex might help. As if. On further meditation, I think I'm going to move that French dart altogether. Quick drafting infobyte: French darts are best for slender people who are less well-endowed. People with larger cup sizes do better with darts that open into the armscye, where gaping tends to be an issue. I almost always use armscye darts (and princess seams that originate in the armscye) in my garments. 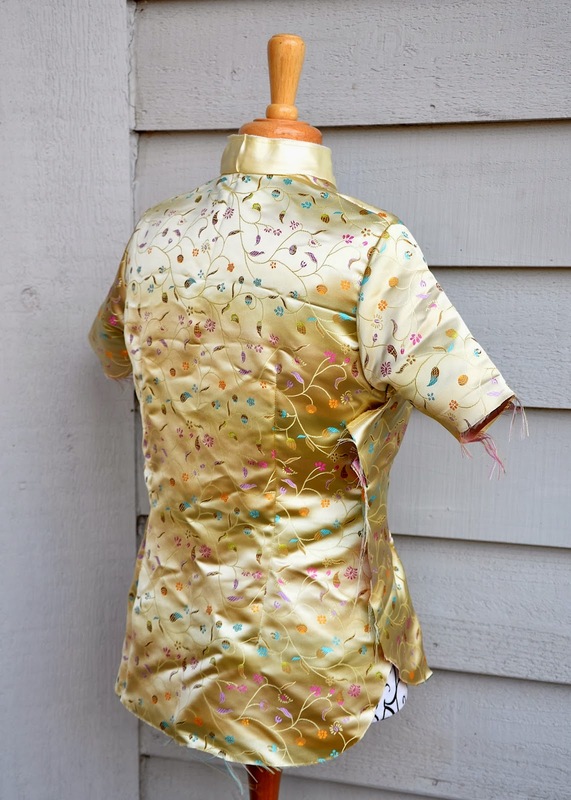 However, this qipao style has a wrap front that doesn't easily accommodate armsyce darts. Hence the French darts. Which don't work for me. But which I am determined to make work in this garment. The back now. That passes, too. This thing will have a separating size zipper, incidentally. Which I'm not going to install until the wretched darts are sorted out. Moving on... ah, the armscye. Again, let us berate the armscye. It is too low and overall too large. Nnnnggggghhhhrrrrrr. Seriously, when I first tried this on, it felt as if I were wearing pyjamas. I will say that I am content to stop here for now. This is the first fitting- disastrous, naturally. But not unusual, as far as first fittings go, especially when one is already expecting bizarre outcomes from non-preferred dart choices. The plan was really to make this first draft to test the collar (which passed, as said earlier) and to visualize the color scheme enough to start making coordinating frog button closures while we're on the road to visit family for Thanksgiving. Incidentally, with what am I going to pair this blouse if when it does fit properly? Indigo jeans, of course. And metallic sandals. And a small clutch. And sunglasses. And pearl earrings. How else does an Asian person wear traditional ethnic pieces without looking like she belongs in a bygone era? 1 Here is a much later post on darts, including French darts. It may help with visualizing its shaping effect, particularly compared to bust darts, underbust/waist darts, shoulder darts and combinations thereof. 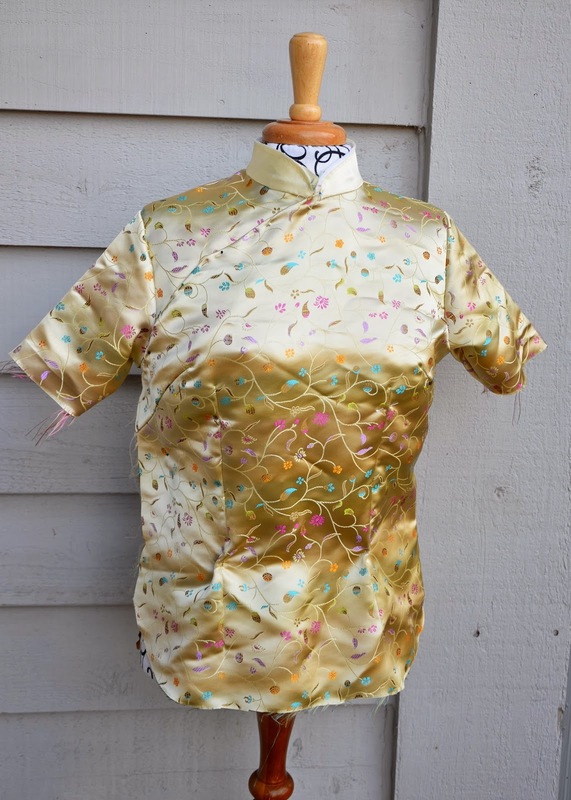 2 I have since finished this qipao blouse and am thrilled to say that it looks quite different (in a good way). Here is the post with the happy ending, and here is the post in which I showed how we got there. Of course I was distracted by the fabric... it's beautiful!! I love this post! Thank you SO much for the packed-with-information posts. It helps me look at my own things and understand what I'm doing wrong...I swear, I've read at least eight different descriptions of the different! kinds! of darts! none of which said, "by the way, gaping at the armscye, first is from a large cup-size, and second, can be fixed by putting a dart-opening there." Brilliant. I'm not American, but if I celebrated thanksgiving I'd be thankful for your teacher's spirit. It certainly benefits me! Did I understand correctly (from what I see here and my Google searches) that the dart is French because it doesn't go all the way to the bottom of the skirt? Now I want to see how you fix this! And, I would never have noticed any of the issues if you hadn't pointed them out - gorgeous fabric! MaryAnne: French darts are those diagonal "side" darts that originate at the bust apex and open into the side seam, under the armpit. Thanks, LiEr! Some of my internet sources are wrong then. Definitely see how that is tricky. MaryAnne: no, I don't think they're wrong. See my very long comment below. The important discriminating feature of French darts (on which everyone does agree, thankfully) is that they are diagonal, they have one end in the side seam and the other near the bust apex. The actual location on the side seam can be different - some of us have it very close to the armpit and some have it very low on the waist. Depends on your own particular contours - we usually position the fattest part of the dart where the body is hollowest, so that it can take in the most ease there. I always thought French darts were long diagonal side seam darts that start a couple inches above the waist and end near the apex of the bust. But In my Google search I see a few other bloggers referring to French darts - a combined bust and waist dart emerging from the side seam. Hmm wonder which is correct? Those lovely rayon/poly brocades are always a booger to work with, but if you work through the challenges, it will be a really cute top. Audrey: you're right, and so are those google people. See my long comment below. We're all talking about the same thing, but maybe without the understanding that the angle of slant of the French dart is variable i.e. we can slant it as much or as little as we like. Some French darts begin closer to the armpit and some closer to the waist. Depends on one's particular body shape. As I said in my reply to MaryAnne's comment above, we position the fattest part of a dart where the body is hollowest, so that it can take in the most ease there. Some people are hollower immediately under the bust, and some are hollower around their waist, so that would be where the wide end of the dart is drafted. MaryAnne and Audrey: I was initially perplexed by the "alternative" definition of French darts by those other sources you both mentioned, until I read them. I think we both mean the same thing, but are referring to different portions of the same dart. So let me see if I can help sort this out. French darts are diagonal darts, not vertical or horizontal. They also point downwards from the bust apex to the side seam. And, therefore, because they make a large, obtuse angle with the side seam, they appear as though they join to the side seam as one long, curved dart (with the side seam forming part of the "dart"). Some sources say they take the place of the waist dart because their deep slant has a vertical component (as opposed to a typical armscye dart which is almost only horizontal) which has a similar ease-reduction effect as the vertical waist contour dart (skinny diamond shaped thing with two apices). Which is, I suppose, another way of saying that French darts are, thus, a "combined" waist and bust dart; not that they are a continuous waist-and-bust dart the way a princess seam is, but that their effect combines the ease-reduction functions of both the waist and (a) bust dart. Some people (e.g. the ones with smaller cup sizes) can get by with just a French dart and no other; others (e.g. the ones with larger cup sizes) have deeper contours that may need both the French dart AND the additional vertical waist dart. Hope this helps. I'm very late to this topic, but just want to add my thanks. I read about someone struggling with 'French darts' and googled it. Of course your title attracted me, and I recognized your blog, and THANK YOU. Clear, sensible and generous explanation. And justification for my two dart bodice sloper! !